An audio companion to the enormously successful New York Times bestselling relationship book, Getting the Love You Want: A Guide for Couples. The Getting the Love You Want Audio Companion, is designed for couples seeking a practical route back to intimacy and passionate friendship. This companion contains a unique twelve-week course which includes complete step-by-step instructions for transforming relationships into a lasting source of love and companionship. 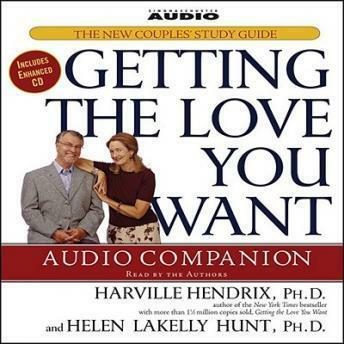 For those of us struggling to maintain our most precious relationships, the Getting the Love You Want Audio Companion helps us grow aware of our individual, unconscious agenda while steering us towards a more harmonious link with our loved ones that will satisfy our deepest need. The audio was not very useful or helpful without the actual book. It was senseless to hear exercises that one could not perform, and most of it was repetitive near the end. Great and deep work. Not a candidate for listen while driving. It requires a lot of writing.